There is a special importance of Bhairav in tantra sadhana. Bhairav is the dire form of lord Shiva. But at many places it is considered as son of lord Shiva. People who follow lord Shiva, they called as Bhairav. You can get rid of threat and depression by worshiping lord Bhairav. A person gets courage. Lord Bhairav is worshiped to overcome obstacles of Shani and Rahu. One can get immediate results if he worships Bhairav on Saturday. 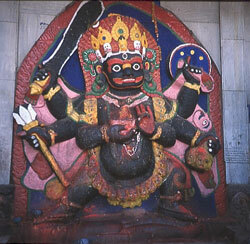 There are several form of Bhairav such as Ashitang Bhairav, Rudra Bhairav, Batuk Bhairav and Kaal Bhairav. Batuk Bhairav is the child form of lord Shiva. He is also called as Anand Bhairav. You can get immediate results by worshiping him. Kaal Bhairav is the courageous form. You can get rid of enemies, problems by worshiping him. You can also win in litigation matters. The worship of Ashitang Bhairav and Rudra Bhairav is very special. It is used for absolution and Kundilini jagaran. Bhairav: You can worship Bhairav on Tuesday or Saturday. Light a big mustard oil lamp in front of him. Keep Urad product as sacrament. You can also offer nectar or vinegar for special mercy. In vengeful prayer, you can offer alcohol. Chant Bhairav hymn after offering sacrament. Householder should avoid doing vengeful prayer of Bhairav. In normal condition, you should worship Batuk Bhairav. It is the gentle worship. Never worship Kaal Bhairav to harm someone. You should worship Kaal Bhairav under the protection of learned idol. “Om Bhum Bhairavaya Anishthanivarayana Swaha” is the basic hymn of lord Bhairav. Remedy: You should ask others to have food when you eat it. After that you can start to have it. If you do this, you won’t face shortage of food and water.